As the state's designated water management agency, the OWRB appropriates stream water and groundwater. Permits must be obtained from the OWRB for all uses of water in Oklahoma with the exception of domestic use. Water is allocated in acre-feet, the amount that would cover one acre of land with water one foot deep or 325,851 gallons. 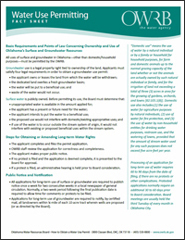 To acquire a water right, a permit application must be filed and considered for approval by the nine-member Water Board. Groundwater is private property that belongs to the overlying surface owner and is subject to reasonable regulation by the OWRB. Stream water (or surface water) is considered to be publicly owned and subject to appropriation by the OWRB. Surface supplies in the Grand River Basin, including a major portion of northeast Oklahoma, are under the jurisdiction of the Grand River Dam Authority (GRDA). Beneficial use of water is a fundamental requirement in the administration of water rights. Beneficial uses include agriculture, irrigation, water supply, hydroelectric power generation, municipal, industrial, navigation, recreation, and fish and wildlife propagation. "Domestic use" means the use of water by a natural individual or by a family or household for household purposes, for farm and domestic animals up to the normal grazing capacity of the land whether or not the animals are actually owned by such natural individual or family, and for the irrigation of land not exceeding a total of three acres in area for the growing of gardens, orchards, and lawns [82:105.1(B)]. Domestic use also includes: (1) the use of water for agriculture purposes by natural individuals, (2) use of water for fire protection, and (3) the use of water by nonhousehold entities for drinking water purposes, restroom use, and the watering of lawns, provided that the amount of stream water used for any such purposes does not exceed five acre-feet per year.